A good herb garden layout can ensure that your plants thrive all season with minimal care. There are three common herb garden layouts. Each has specific advantages, though some may be more appropriate than others, depending on the space and time you wish to devote to your herb garden. Container planting is a popular method for herb gardening. The largest mistake that novices make is choosing a pot that is too small to accommodate the herbs. In general, you should allow one gallon of pot space for every plant you wish to grow in that pot. Try not to crowd the herbs, and choose herbs that prefer similar soil and sun conditions for a single pot. Of course, you can also plant the herbs in individual pots. This has the advantage of giving each herb an equal chance to grow as well as its own preferred soil conditions. Larger herbs, like rosemary, will be kept at a manageable size as long as the pot remains no larger than three gallons. You can also create different groupings using the pots to accentuate a porch, patio, or kitchen. If you intend to grow enough herbs to dry and save for the winter, outdoor planting is an excellent choice. A basic herb garden is easily constructed if you have any other gardening experience. Once again, soil and sun preferences are paramount in achieving a healthy-looking herb garden.When planting the seedlings or seeds in a bed, keep in mind their height and branch spread. This will allow you to estimate the amount of space required for each plant to grow properly. It will also allow you to place the plants so that larger herbs do not overshadow smaller plants. Decorative herb planting was a popular yard embellishment in turn of the century homes. While now considered a bit old fashioned, it can still be an excellent complement to most yards, especially if you have a historical home.Decorative herb planting requires some advanced planning. Start with some graph paper and make a scaled drawing of the herb bed you want. Consider looking at old photographs and doing some research at the library for design ideas. Celtic knots and other intricate designs can all be achieved with herbs. After planning the herb bed, use twine, stakes, and a ruler to lay out the pattern on your prepared garden bed. You can plant seeds or seedlings to create the pattern. Using both is a good option that allows you to loosely create the pattern with bought plants and fill in with herb seeds. Herbs used in decorative plantings are usually not used in cooking. Many herbs, such as thyme, have inedible varieties. However, these varieties are highly prized in decorative herb gardens where a thick thyme lawn is a source of pride. Even inedible varieties often have a delicious smell that is worth the time involved in tending them. Creating a workable herb garden layout relies on knowing the expected height and spread of your plants as well as their preferred growing conditions. Utilizing information for each specific herb variety is preferable. However, there are some general guidelines for each, which can be useful in the initial planning process. Basil Full Sun Rich, Moist Soil 14-18" 8-10"
Chives Full or Partial Sun Average to Rich, Moist Soil 6-10" 10-12"
Coriander Full Sun Rich Soil 22-34" 6-8"
Dill Full Sun Average, Moist Soil 24-36" 6-8"
Oregano Full Sun Average to Sandy Soil 16-20" 10-14"
Rosemary Full Sun Sandy Soil 48"+ 18-24"
Sage Full Sun Sandy Soil 18-20" 20-24"
Thyme Full Sun or Partial Sun Average Soil 2-10" 12-24"
Keep in mind that closely crowded herbs will affect production, but also the amount of weeding. Closely packed herbs may not grow as quickly, but the time spent weeding diminishes as the plants gain dominance in the bed. While decorative herb gardens may be alluring, start slowly with a smaller bed or large standard outdoor garden. 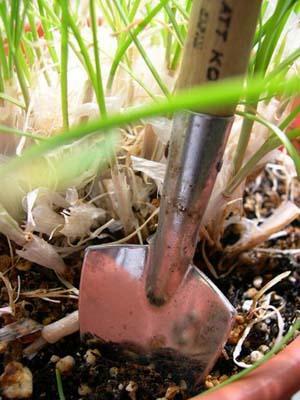 You should also consider growing your own seedlings from seeds or cuttings if you intend on planting a large garden. Be sure to plan carefully to prevent costly and time-consuming mistakes, no matter which type of garden you choose to plant.